The US Navy knows a thing or two about firefighting. It seems that if three or more fuelled planes are on fire together, they can’t be extinguished. They must be allowed to burn out. It’s obviously a bad idea to park fuelled planes together in a bunch. They might not present a prime target, but, since they can’t be put out, their burning could well lead to other fires/explosions. If you are on an airfield, planes can be kept at a distance from each other. In a carrier, everything gets stacked closely together. Today’s invention is a way to ensure that fully fuelled planes never appear together on deck. Each aircraft would take off with a tiny amount of fuel on board. 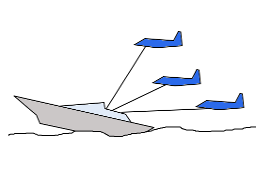 Planes would then rendezvous with one of several armoured hydrofoil powerboats. Each of these would allow multiple fighters to take on fuel rapidly, using in-flight refuelling hoses, as they all sped across the water surface.